The Ohio State University Department of Surgery’s Professional Development and Research Training Program (RTP) prepares surgical trainees for careers in academic surgery through personalized research education, mentorship and career development. Our extensive program focuses on enhancing our trainees’ critical thinking skills and developing their clinical and translational research competencies. Additionally, we emphasize scholarship, self-reflection, leadership experiences and networking to advance their career development. The ultimate goal of this program is to train surgeons to perform and lead impactful translational, clinical and health services research and/or surgery education research that will enhance the care of surgical patients. 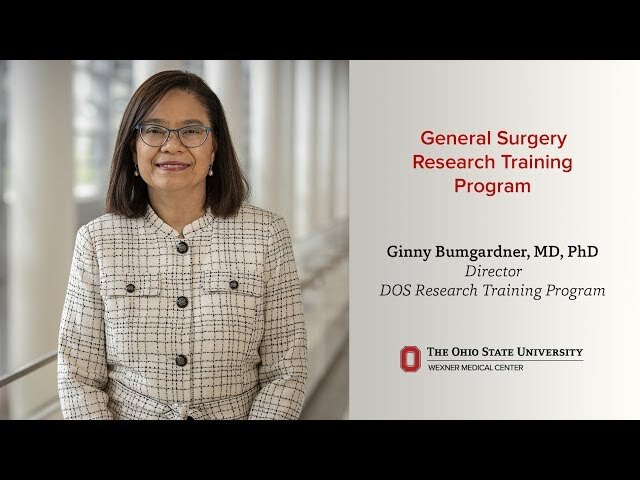 Dr. Ginny Bumgardner’s vision for enhancing the care of surgical patients through strengthening the surgeon-scientist pipeline was the catalyst behind the creation of the Professional Development and Research Training Program. Trainees select their mentor, apply to graduate school, submit fellowship and funding applications and select courses that fulfill advanced degree curricular requirements. In this phase, trainees conduct mentored research, participate in research-in-progress presentations and attend quarterly meetings, submit abstracts to and present research results at national meetings, network with members of the research and professional community, receive feedback and periodically self-assess their progress toward individualized training goals and continue to participate in core departmental activities. This last phase includes participating in departmental or institutional committees, taking on leadership responsibilities for committee work or special projects, continuing publication and research presentations, applying to surgery subspecialty fellowships or other specialty training and serving as a resource for new surgery residents. Our residents all agree that they are better physicians because of their experiences in the research training program. Watch below as Anahita Jalilvand, MD, describes how she found part of her identity as an academic surgeon through the Professional Development and Research Training Program. Hear from more residents who have completed the program. An interview with Dr. Bumgardner was featured recently in the national medical journal Transplantation. In the interview, she advocated for training programs that develop surgery trainees into surgeon-scientists who will identify, research and create innovative solutions to issues impacting the quality of surgery patient care.